We have a unique variety of stunning sunglasses from a range of independent designers. 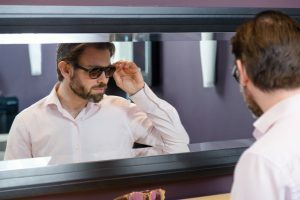 Hawaiian favourite Maui Jim continues to produce the highest quality sunglasses, with polarised frames providing the finest clarity in all conditions. Then there is Vinyl Factory which oozes personality with its retro range. For standout style, French designers Anne et Valentin are the choice for colourful, post-modern chic. Of course, all our sunglasses are available in prescription or non-prescription lenses. Current patients can also enjoy spreading payments with our 0% finance option (terms and conditions apply). A couple of months later than we’d hoped, but spring is now here to stay! It’s time to get your frame on and start thinking about the ultimate statement accessory – we’re talking sunglasses, of course. Every new season is worthy of exciting new shades and none more so than s/s. Not only can they make you look ‘on point’ but they’ll hide a weary eye or even a multitude of sins. Let’s not forget the important job they do too of protecting your eyes and delicate surrounding skin from the harsh sunlight and its harmful rays. Once again, this season brings a vast array of shapes, colours and materials. But, it’s a bit of a yin/yang affair in the high-fashion stakes. You can either go larger than large or super-micro-small. It’s the bigger frames that are the star attraction however, with cat eyes in all manner of sizes, stealing the show. So, sunshine, please stick around, and we’ll make sure you’re ready for it with our abundant range of stylish shades. Let’s start with top sunnies producer and hot Hawaiian favourite, Maui Jim. These guys are all about making the highest quality sunglasses with polarised lenses. Treat yourself to a pair of these and you’ll see ‘the world in more detail’. They provide the finest clarity in all conditions, making them a big favourite with sporties. These Starfish ones in Sandstone blue will get you new-season set – they’re big, catty and boast one of the latest trends for rose-tinted lenses. Why not pink it up further with these ‘pink with pink Tokyo’ Ilima ones to accentuate your summer look? Or, you can opt for a smaller frame like the Kanaha and join the celeb-insta-pack rockin’ the micro-glasses trend. Maybe you would rather fall in love with the superbly-handcrafted, premium-made sunglasses by NOT IN LOVE. This is a brand that brought their vision to life to make your sunglasses dreams come true. Don’t let them down. Share the love with the likes of this 50’s inspired pair,Glow. With its on trend shape, black acetate frame and gold detail, you’ll undoubtedly stun in your sunnies. And, it’s their Electraglides that are the shades to be seen in this season. With their oversized angular frame, translucent blue acetate frame and solid blue lens, they’re simply ticking all the s/s boxes. Over at Anne et Valentin, it’s sophisticated style with a colourful flavour. The Eclipse in Solsticeis their go-to, cat eye of the season, offering maximum drama and the chance to snap-up the bi-colour frame trend. Do it! While the Barock’n’roll with its retro-yet futuristic look taps into the smaller, edgier look. Full of personality they’re perfect for a man or a woman and will frame a small or large face beautifully. Keeping it French but upping the vintage ante, is Vinyl Factory’s charming collection. A haven for music-lovers, each frame has a retro-flair and is named after the greatest performers of all time. From Bowie to Hendrix and Dusty to Debbie you can epitomise your hero by adorning a pair. Or, you can simply pick your favourite from its latest range and update your look. The charming, round and metal framed Hassan will certainly do that. While the sharper Hatherley’s tortoise frames with a blend of blue will be sure to make you stand out in the crowd this coming season. One of our latest brands, Garrett Leight, solves the age-old problem for prescription glasses wearers. No longer do you need to be squinting in your glasses when the sun comes out because you don’t have prescription sunnies. Just clip these on and you’re good to go. Finally a designer has nailed the sunglasses clip ons, instantly transforming your frames from glasses to sunglasses. Finally, if an independent designer isn’t unique enough for you, design your own. Select every layer of wood, every colour, the shape, even the inscription. Handmade in Italy, this innovative range from Feb31st will ensure ‘unique’ can be taken literally with no room for copycats. All frames are available from the Frame Room eyewear boutique at Cameron Optometry, 5 St Vincent Street, Edinburgh. Gift vouchers are also available for the frame-lover in your life.